PLANO/FRISCO, TEXAS — Amid national attention to the real estate market, real estate professional JEANIE E. ELLIOTT OF JEANIE ELLIOTT REALTORS acquired new skills to decrease market time and maximize selling prices. 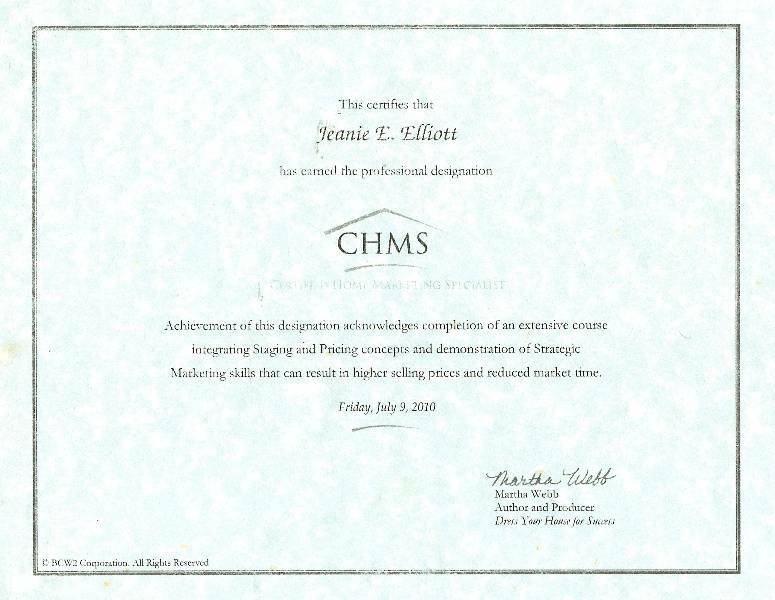 Eager to develop a new approach for timely, efficient home sales, MS. ELLIOTT attended the nationally renowned Certified Home Marketing Specialist Course taught by Martha Webb on JULY 9, 2010 at Champions School of Real Estate in Plano, Texas. Addressing in-depth market analysis, strategic pricing and effective home staging, the Certified Home Marketing Specialist Course provides agents and brokers with much expertise to excel in today’s competitive real estate environment. The result? Homes sell faster at better prices — in any market. Ms. Webb, author and producer of Dress Your House for Success and one of the country’s foremost authorities on home staging, has taught her proprietary system for increased sales and maximum profit to thousands of real estate agents nationwide. Now, MS. ELLIOTT has joined this prestigious group by achieving professional certification as a Home Marketing Specialist following her participation in this high intensity course and completion the course examination to test concepts and understanding. “This course is a must for any agent who wants to provide the best service possible,” says MS. ELLIOTT. “Having this certification means I can offer my clients a level of expertise that you just don’t learn in standard classes. “Now, instead of just saying ‘make sure everything’s clean’ before a showing, I can go through the house with my clients, room by room, and point out things we can do to help potential buyers connect emotionally with the house. “Strategic pricing is key to moving properties quickly in any market. Add staging to the equation and you have the enviable position of being able to give buyers a true feeling for what it would be like to live there while sellers get the benefit of faster sales at the best price possible,” MS. ELLIOTT adds. A phenomenon that’s swept the real estate industry over the past several years, home staging has increasingly become an integral component of any successful home sale. Real estate agents who have completed the Certified Home Marketing Specialist course offer clients concrete, market-specific guidance to position properties to make a direct emotional connection with potential buyers. “We talk a lot about ‘buyer’s’ markets and ‘seller’s’ markets, but what it all boils down to is knowing how to effectively reach out to home buyers regardless of the market,” says JEANIE E. ELLIOTT, BROKER/MANAGER OF JEANIE ELLIOTT, INC. REALTORS. “The Certified Home Marketing Specialist Course presented by Martha Webb gives agents and real estate brokers those skills. JEANIE ELLIOTT REALTORS specializes in the areas of Allen, Lovejoy ISD, Plano, Frisco, McKinney, Fairview, Lucas, Parker, Prosper, Lavon, Little Elm, Murphy, Wylie, Celina, Richardson, North Dallas, Addison, The Colony, Melissa, Anna, St. Paul, Collin County, Denton County and North Texas fine homes, luxury properties, estate homes and lots, acreage communities, gated and guarded subdivisions, fine country properties with acreage, farms and ranches, luxury townhomes, condos and townhouses, new custom houses, builders luxury homes, foreclosed properties, REO'S and bank-owned homes, seniors real estate properties & active-adult lifestyle communities, and waterfront and lake houses. "Celebrating Our 33rd Anniversary Selling Collin County & North Texas in 2013"